“Launched in 2008, the Books and beyond campaign was created not only to promote the exciting wealth of resources available at Alberta’s libraries, but to break existing stereotypes with a serious dose of irony.”1 The campaign was ambitious, spanning print, digital, audio and video. Designed and executed by Rethink Canada (who recently produced the Molson Canadians-only beer fridge), the campaign was critically successful – it won third place in the International Federation of Library Associations and Institutions (IFLA) Marketing Awards for 2009, and the video spots were featured in TBS’s Very Funny Ads. The campaign also featured a new website, but the URL is unfortunately now defunct (a screenshot that is on the Rethink website is reproduced below). What makes this campaign somewhat rare is that it attempts to inject some wit into library marketing (and it may not be to everyone’s taste); campaigns of this size seem to aim for different emotions, so it’s interesting to see one so firmly tongue-in-cheek. 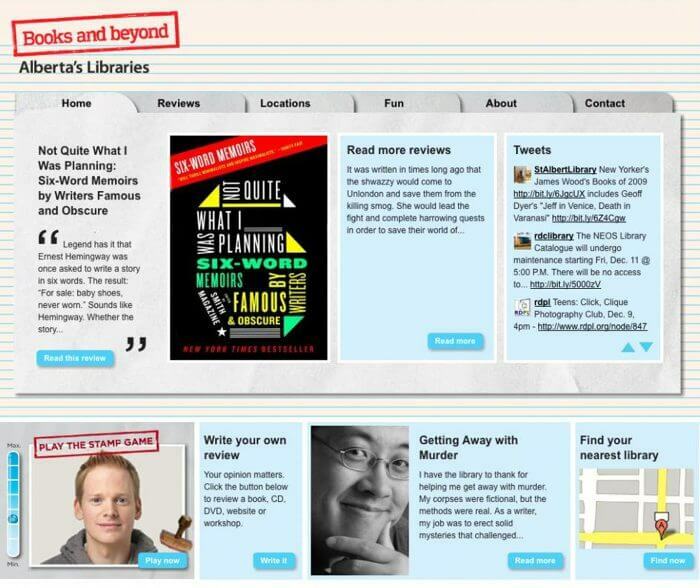 The marketing materials featured on this page were sourced from the The Alberta Library toolkit, with the exception of the website screenshot and the stamped face print ads (below), which were sourced from the Rethink Canada page. This is easily the best library marketing campaign I’ve ever seen. Great idea and execution.